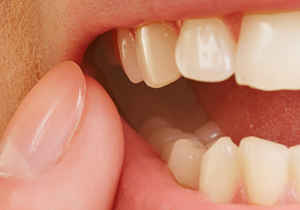 Swollen and painful gums are symptoms of an inflammatory gum disease (also known as periodontal disease). Swelling occurs from an auto-immune response of the body reacting to an infection. Infections are noticeable through pain, redness, and warmth. If the infection is left untreated, it can affect the bone near the teeth. The body’s immune system wants to rid the bone of the harmful material the bacteria is creating. Over time, bone loss will ensue. If you’re experiencing gum or mouth pain, call the caring staff at Hales Parker Dentistry right away. Inflammation in the gums also is associated with atherosclerosis, the occurrence of fatty deposits inside of the body’s arteries. Inflammation coincides with an increase of the blood protein CRP (C-reactive protein), produced by the liver. The more inflammation there is, the more the liver produces CRP. The more CRP present, the more likely cardiovascular disease is present, along with related problems. CRP production is also related to arthritis, auto-immune disorders, and intestinal issues. It is vital to practice preventive dental care daily at home and make regular visits to the dentist. Dental appointments should include an exam, cleaning, and full mouth x-rays, along with the vital knowledge and instruction on how to properly care for teeth and gums at home. It is also very important to see your dentist promptly if a tooth suddenly becomes sensitive or you observe any other changes. Thanks for visiting our blog. For more specifics about inflammation or periodontal disease, give us a call at 949-429-0049.